← Do you love to be swept away? What a great way to start 2012! This award is given to bloggers, by bloggers (another reason I love the blogging community). Pass this award along to recently discovered blogs you enjoy reading (some say to 15 some say to less than that.. I did 15). 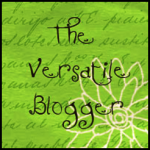 I was awarded the Versatile Blogger Award by Deb at http://365daysofcourage.wordpress.com/ literally weeks ago and more recently by 3 other bloggers: Karen at http://cravencreativity.wordpress.com/and 2 others that I cannot find now. Rather than procrastinate any longer trying to find them, i will have to edit and add them later. Or I will have to do a separate blog and come up with more bloggers. I have been trying to hand the award out to people that hadn’t yet received it so i could spread it around. I have been procrastinating long enough about re-posting. I have been in the midst of sorting through various recipients of Candle Lighter Awards and have gotten bogged down. First of all, thank you so much Deb, Karen and the other 2 whose names I can’t find. Now, I am supposed to post 7 things about myself. 4. my favorite cartoon when i was a kid was the Road Runner. This entry was posted in Awards and tagged inspiration, versatile blogger award. Bookmark the permalink. Congrats Kate!! Yes my dear, You are so deserving. you are SO life affirming. thank you! Thanks a lot for Choosing my Blog for this Award among others.About the Versatile Award i never ever thought about that i would get it this much Soon.Am very Glad to accept it from you. Congrats Kate…keep sharing the love! Pingback: Thanks Giving for an Award!!! | Charismatick! will check it out after work—i want to look at it more closely. Congrats on award and Thank you!